Prepare yourself for more a lot of mayonnaise. 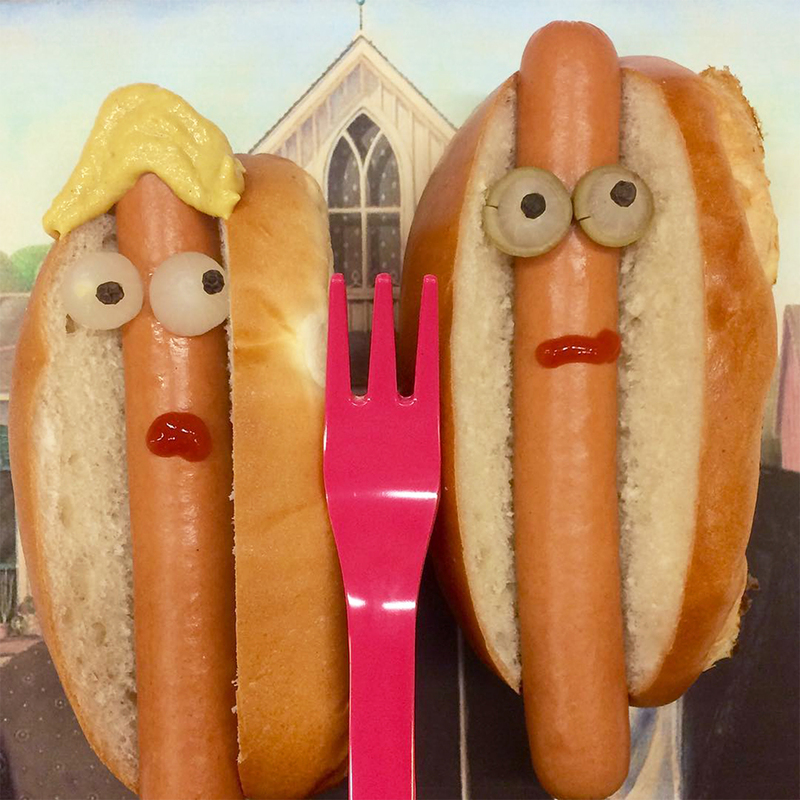 Today is National Hot Dog Day and while there are many regional American hot dog styles that we love, looking beyond the American borders opens up a whole new world frankfurters. Here are nine international versions of the dog that you’re sure to love. Brazil’s cachorro quente is readily available all of over the country's largest cities and is one of many South American takes on the hot dog that includes a massive number of toppings. The essential ingredients are a hot dog topped with seasoned ground beef, a pico de gallo-like blend of bell peppers, tomatoes and onion, canned corn and peas, grated Parmesan cheese, shredded carrots, diced ham or bacon, fresh cilantro, shoestring potato sticks, a hardboiled quail egg and sometimes mashed potatoes. While this beloved style is available throughout Arizona as well, the Sonoran dog originated across the border in Hermosillo, the capital of the Mexican state of Sonora. The Sonoran dog includes a bacon-wrapped hot dog grilled, served on a bolillo-style roll and topped with pinto beans, onions, tomatoes, and often times mayonnaise, mustard, and jalapeño salsa. Thank you #queensinternationalnightmarket for the picture! One of Chile’s most popular street foods is the Completo, a hot dog that includes chopped tomatoes, avocado, mayonnaise, sauerkraut, chili, an herb-based sauce and cheese. At only 1,000 pesos (about $1.55), the Completo is quite a deal too. Much like pizza in New York, the hot dog, or Pølse, is a local obsession in Demark. While there are many different varieties to try, the most popular style is a hot dog topped with apple ketchup, mustard, remoulade, chopped onions, fried onions, and crisp, sweet pickles. In the pantheon of global hot dogs, the Swedish take, known as Tunnbrödsrulle, is certainly one of the most indulgent. Sweden’s masterpiece consists of a pork-beef hot dog tucked into a buttered tunnbröd (northern Swedish flatbread) with mayonnaise, mashed potatoes, fried onions, raw onions, and shrimp salad. Iceland's reputation for natural beauty often tends to overshadow its for culinary creativity, but one edible item that certainly merits a mention is the pylsa men öllu, or the “hot dog with everything.” The hot dog is served in a bun and liberally covered with fried onion, raw onion, a peanut butter-esque mustard, ketchup and remoulade. Unlike most of the hot dogs on this list, Colombia’s perros caliente balances the savory with the sweet. This Colombian take on the hot dog is topped with ketchup, mustard, salsa rosada (ketchup and mayonnaise), mayonnaise, pineapple sauce, cheese and crumbled potato chips. Additionally, some vendors also top it with a cooked quail's egg. Guatemala’s take on the hot dog, known as the shuco, is traditionally made with a split dog topped with guacamole, boiled cabbage, mayonnaise, mustard and bacon or ham. The Czech Republic’s most famous hot dog, known as the párek v rohlíku, isn’t distinct for its toppings, often just ketchup and/or mustard. Instead, it’s the style of bun that is commonly served with the hot dog that differs. Rather than slicing the bun in half, this Czech-style dog has the top of the bun cut off, with a hole punched into the softer inside of the bun where the condiments and hot dog are then placed.